When most of us make purchases we like to think of our decisions as "rational". We need to buy [X] because we "need" it. It will make our life easier. It will make our life "better". But as we so often realize, what we want and what we need are two very different things. We humans are an emotional bunch (We all know you cried at the end of Titanic). Many of our purchasing decisions can be swayed simply by how we feel that day. It is the difference between choosing a Mac or a Windows computer. It's how we decide between a pair of Nikes or Adidas. If we're honest with ourselves we know these products are just computers and shoes. They're just wrapped in different packaging. But we rationalize that one is better or one is higher quality. Because we're all emotionally compromised. Why we choose one over the other stems from the subconscious biases we've developed day after day. The internal dialogue we have with ourselves is formed by our emotional connection with the brands we love. Does a PC fulfill the image I have of myself of a creative pro? Can I trust that Nike values excellence and performance above all else like I do? While it is still important to educate customers on your products and features, it is even more important to speak to their emotions. In this article we'll look at the role of human emotion in decision making and how we can use it in marketing. In the book Descartes' Error, Antonio Damasio, professor of neuroscience at the University of Southern California says that when we're confronted with a buying decision, emotions associated with previous related experienced affix values to the options we consider. These emotions then create preferences or biases that lead to our decisions. We remember the first Happy Meal we had when we were young and the smile stretched across our face when we pulled out the toy. So the experience is affixed to the options we consider when choosing between fast food. Damasio discovered this in his study of people whose connections between the "thinking" and "emotional" areas of the brain had been damaged. Without that connection these people were able to rationally processes the information but were unable to make a decision because they lacked a sense of how they felt about the decision. fMRI neuro-imagery shows that when evaluating brands, consumers primarily use emotions (personal feelings and experiences) rather than information (brand attributes, features, and facts). *Advertising research reveals that emotional response to an ad has far greater influence on a consumer’s reported intent to buy a product than does the ad’s content – by a factor of 3-to-1 for television commercials and 2-to-1 for print ads. The power of a simple television commercial or a short ad that plays before a YouTube video is often understated. We connect an emotion to a brand much like we do another person. We say that brand is funny, we say it's smart, or we love what they represent. We choose Advil over the identical generic drugstore brand because we believe it will help us get back to normal like the happy faces in the commercials. What tools can marketers use to speak to a person's emotions? Visuals. A picture says a thousand words. A sad face, a big smile, or a confused glance are enough to communicate a myriad of emotions to the viewer. Strong imagery and compelling videos are imperative tools for creating emotional connections. Storytelling. We all have stories from our childhood, fictional or not. They shape the way we develop and the way we see the world. Research has shown that marketing and promotion that is shared in the form of a story consistently outperforms content that isn't. A strong story creates emotional investment in the product or service you are marketing. Emotional copywriting. Choose your words carefully. Some words pack a punch while others fall flat. Words that appeal to human emotions stir up very real physical reactions. Social proof. Peer pressure, as much as you try to avoid it, is present in much of the choices we make. Humans yearn to be part of the group so we will often do as the group does. Reading an online review of a restaurant pales in comparison to a 5-star recommendation from a friend. A photo of your ideal customer or a raving testimonial are powerful tools all marketers should include in their communication. 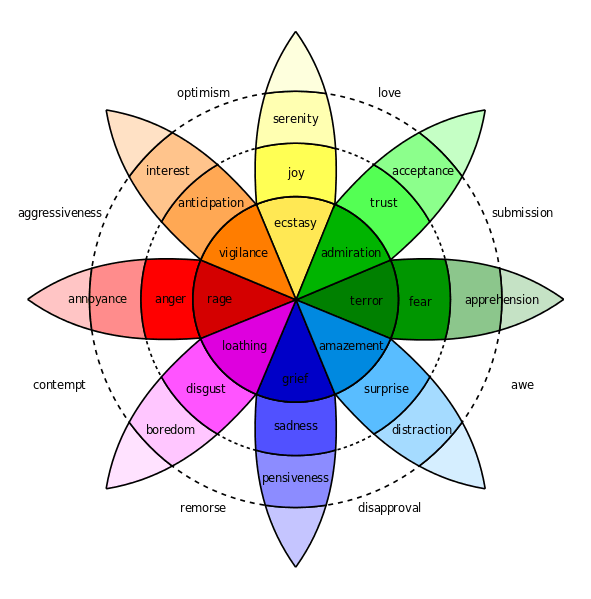 Robert Plutchik's famous "wheel of emotions" shows just how humans are emotionally layered. The outside layer starts on the surface with emotions like annoyance, interest, and apprehension and moves inwards to the more intense emotions like rage, terror, and ecstasy. Marketers of course should aim for the centre. Aiming to produce emotions on the outer layer wouldn't have much impact on consumer behaviour. It's closer to the centre where raw emotions are connected to the area of the brain where they can affect decisions. It's where the magic happens. Mega brands like Coca Cola, McDonald's, and Old Spice all market happiness. Studies have shown that marketing and advertising that makes people laugh, smile, and react positively receive more shares and positive engagements online. One of the most shared YouTube videos of all time Android's Friends Furever, shows how unlikely animal buddies can create happiness in the name of branding. It says Android is fun, happy, accessible, and playful. You've seen the Unicef ads, the ones asking for donations for starving children in Africa. Footage of poverty and despair are all attempts to create sadness so viewers pull out their wallets to donate. The best use of sadness I've seen was Apple's The Song holiday commercial. It's not tear jerking sadness persay but it does tug on your heartstrings by making viewers remember the old times and the nostalgia of youth. Apple, as always, is absolutely masterful in the ways it ties emotions to its products in all of its marketing. Fear is a strong motivator for many of the actions we take daily. We put on a seatbelt for safety and avoid speeding so we don't get ticketed. Scare tactics create urgency and immediate reaction to prevent something horrible from happening. These scare tactics are seen in commercials for smoking, drunk driving, global warming, prescription drugs, I could go on forever. Fear is everywhere. Fear can be the strongest emotion for many because we immediately wish to eliminate it. People want happiness, and happiness is freedom from fear. In most cases avoiding anger is important in marketing. The last thing you want is someone angry at your business. But in some cases anger can be directed towards a spur of action. Social injustices that we see around the world can create anger and frustration. More than often it leads to change. This ad from Always #LikeAGirl highlights the gender biases that plague our society. It's meant to create frustration but more importantly a demand for change. Always wants to be the brand that represents change and they've chosen to do that through a frustration that we all share. It is important to educate your customers but don't stop there. Take it a step further and speak to their emotions. Targeting and pushing emotional buttons are what creates an unflinching love (or hate) for a brand. How do you work to make your marketing more emotional? What has worked. What hasn't? Share your story with me below and weigh in!